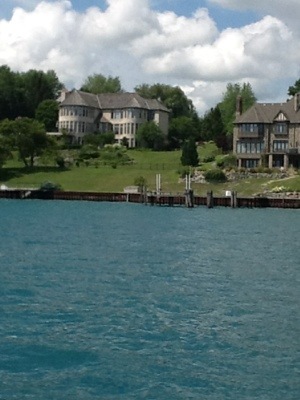 These photos were taken today as we motored down the St. Clair River. It is a very interesting and busy river with lots of industry and just as many houses and cottages. 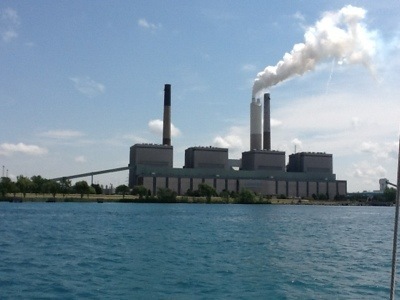 The picture of the houses is from the American side – they are looking at the beautiful smoke stack on the Canadian side. It is actually the coal generated power plant. I guess we have to have to have these factories somewhere, so Sarnia seems to be as good a place as any. 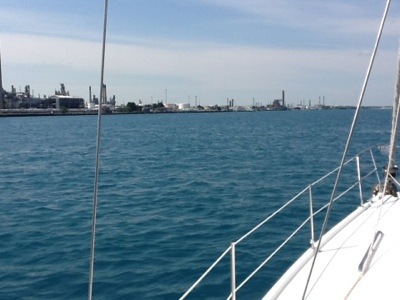 Our trip down the St. Clair was uneventful – lots of boat traffic. There were four or five large ships as well as a ton of powerboats, jet-skis and even waterskiers! The trip took about six hours and we totally enjoyed seeing one beautiful house after another (the factories ended fairly quickly after Sarnia). 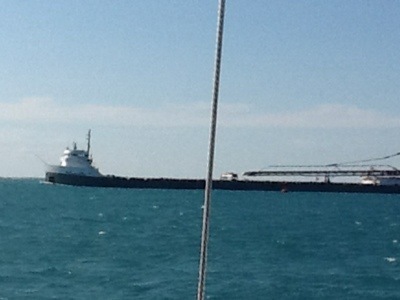 If you look on our Spot, it appears that we are anchored in the middle of Lake St. Clair. This is true but the lake is only 10 – 15 feet deep, so you can pretty much anchor wherever you want as long as you have the right anchor and chain. Dennis has assured me that we have more than enough – 250 feet of chain and an excellent anchor. I have to believe him. We originally wanted to anchor closer to the shore but the shipping channel is right there. The depth goes from 30 feet to 7 feet way too quickly so if we ever broke loose (and of course this would happen in the middle of the night! ), we would drag into the channel. So, we are safely on the other side of the shipping channel and if our anchor drags, we’ll be able to go 18 miles until we hit the shore. This would probably take 20 hours or so, so hopefully we’d have enough sense to notice! Here is a picture of a ship going by. Nothing much else is happening. Tomorrow, we have about 18 miles to get to Windsor. We are meeting Rick, a guy Dennis sold his North Channel and Georgian Bay charts to. We have to go grocery shopping for a few vegetables and some fruit. Should be a good day – nice and sunny but not blistering hot! A special happy birthday tomorrow to Nick, who is staying at the house for the summer!